What parent doesn't want to raise great kids? I know I do. 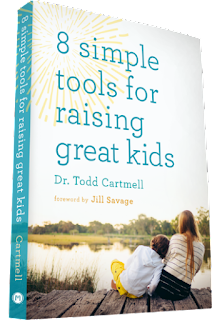 I was recently given the opportunity to review Dr. Todd Cartmell's book 8 Simple Tools for Raising Great Kids, and I am so glad I did. Like its name suggests, this book presents 8 simple tools designed to help parents maintain healthy relationships with their child, develop a nurturing home culture, and correct behavior in lasting ways. Each tool is broken down into 5 short chapters that detail a specific tip for using that tool. The end of each chapter contains a one or two sentence summary of that tip along with questions to consider so that you can reflect on how well you are (or aren't) using that tip in your parenting. Dr. Todd Cartmell earned his doctorate in clinical psychology from Fuller Theological Seminary in Pasadena, CA. He completed a postdoctoral fellowship with Wright State University at the Children’s Hospital. Since then, he has done his clinical work at Summit Clinical Services in Wheaton, IL, where he continues to see children, teens, and families on a full-time basis. He has written five parenting books and has presented many parenting workshops at mom’s conferences (Hearts at Home, MOPS International), MOPS groups, churches, and schools. This book really encouraged me to analyze my parenting. While most of the time I think I already have great kids, I know that there is always room for improvement. I really liked that the chapters were short because I could easily read a chapter or two while waiting for my kids to finish soccer practice in the evenings. 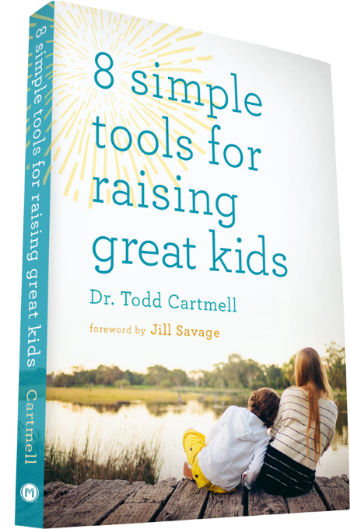 Dr. Cartmell includes many practical tips for parenting, which goes right along with how I learn. I'm not a very abstract thinker; I prefer someone tell me specific suggestions for how to do a better job communicating with my children instead of just saying, "You need to communicate better." I will admit that some of the reflection and application questions stepped on my toes. They made me realize areas where I could do a much better job interacting with my children. For you, my wonderful friends, I get to offer a coupon code when you purchase 8 Simple Tools for Raising Great Kids from Moody Publishers. Use the code GREATKIDS16 to receive 50% off.